Hull City's two-year stay in the Premier League came to an end as they drew with 10-man Manchester United at the KC Stadium. Steve Bruce's men had to win to give themselves any hope of survival. But Newcastle's victory against West Ham took the issue out of their hands, condemning Hull to relegation no matter what their own result. Hull did create chances, forcing Manchester United goalkeeper Victor Valdes to make excellent saves to deny Ahmed Elmohamady and Nikica Jelavic. David Meyler wasted the hosts' clearest chance but they could not find a way through, even after Marouane Fellaini was sent off for a crude challenge on Paul McShane 13 minutes from time. Midfielder Robbie Brady tried to hold back tears at the final whistle as the Hull fans stayed on to show their support for the team. 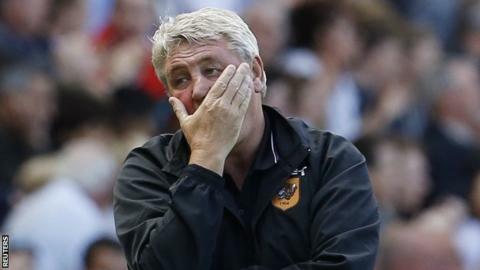 Hull's season started with optimism when they headed to Slovakia to face Odu Trencin in the Europa League on 31 July. Yet the eagerly awaited first European adventure was over by the end of August, having lasted just four matches. Their European campaign contributed two of only 10 victories since Hull's FA Cup final appearance against Arsenal 12 months ago, when they led by two goals but were beaten in extra time. Sunday's blank meant they failed to score in exactly half of their 38 league games. May we get this over with? Hull have never won a Premier League game in the month of May, drawing four and losing nine. Such a scenario cannot have been envisaged by Tigers owner Assem Allam, who sanctioned £40m to bring in 11 new players over the course of the season. The spending, evidently, has not proved value for money. Of the new recruits, only Michael Dawson and Dame N'Doye started the final attempt to salvage Hull's Premier League status. Abel Hernandez, a club-record £10m purchase from Palermo, scored just once in 21 appearances since starting his Hull career with three in five. And the Uruguayan might have caused more problems for himself when he appeared to punch United defender Phil Jones in the stomach as they grappled at a Hull corner following his introduction as a substitute. Jake Livermore was another expensive recruit at £8m. The 25-year-old was unavailable to face United, though, as he awaits the results of a B sample on a positive test for cocaine. Six years ago, Hull also went into a final-day encounter against Manchester United with their top-flight future on the line. They lost to a Darron Gibson goal that day, only for results elsewhere to save them and spark then-manager Phil Brown to burst into song. This time, they were the ones needing both a victory and assistance from other teams. However, as Hull had lost all seven previous top-flight encounters against their opponents, and former Red Devils captain Bruce had mustered the sum total of four draws from 21 games as a manager against his old club, the backdrop was hardly encouraging. A flurry of activity around the visitors' goal midway through the opening period brought both hope and frustration for Hull. McShane and N'Doye had the ball in the net within a couple of minutes of each other but both were ruled out for offside. In between, Elmohamady got on the end of Brady's cross and steered his header towards the bottom corner. Hull were still denied as Valdes, making his full United debut, dived low to save at his left-hand post. United hardly created a chance in the first half, when their most notable event was Angel Di Maria's early exit, another injury ending a disappointing debut campaign for the Argentine. He cost a British record £59.7m from Real Madrid. Meyler turned Jelavic's header wide from eight yards, Hull's last chance before news filtered through of Newcastle's opening goal at St James' Park, which threatened to make their own efforts meaningless. The hosts pressed for a while and Jelavic brought a brilliant save out of Valdes when he turned Sone Aluko's cross goalwards at the near post. But as their situation became hopeless, so the standards of behaviour slipped as well. Referee Lee Probert was well placed to spot Fellaini leaving his foot in on McShane, showing the Belgian a red card just 18 minutes after he had been introduced for Ashley Young. Hull could not take advantage of the extra man and their fans knew their fate had been sealed by Newcastle's victory. Manchester United manager Louis van Gaal: "When we analyse our season, we have played our best matches against the top six and our worst matches against the bottom six." On Fellaini red card: "It is very stupid. I have said to him. He will start next season in the tribune. It is not good." Match ends, Hull City 0, Manchester United 0. Second Half ends, Hull City 0, Manchester United 0. James Wilson (Manchester United) wins a free kick on the left wing. Attempt saved. Sone Aluko (Hull City) left footed shot from outside the box is saved in the bottom right corner. Adnan Januzaj (Manchester United) wins a free kick in the defensive half. Attempt saved. Michael Dawson (Hull City) header from the centre of the box is saved in the bottom left corner. Assisted by Tom Huddlestone. Corner, Manchester United. Conceded by Steve Harper. Attempt saved. Wayne Rooney (Manchester United) right footed shot from outside the box is saved in the top left corner. Adnan Januzaj (Manchester United) wins a free kick in the attacking half. Offside, Hull City. Nikica Jelavic tries a through ball, but Abel Hernández is caught offside. Attempt blocked. Robbie Brady (Hull City) right footed shot from outside the box is blocked. Stephen Quinn (Hull City) wins a free kick on the left wing. Attempt saved. Stephen Quinn (Hull City) left footed shot from outside the box is saved in the top centre of the goal. Assisted by Tom Huddlestone. Substitution, Hull City. Andrew Robertson replaces David Meyler. Attempt missed. Robbie Brady (Hull City) left footed shot from the centre of the box misses to the left. Attempt blocked. Abel Hernández (Hull City) right footed shot from the centre of the box is blocked. Delay in match Paul McShane (Hull City) because of an injury. Marouane Fellaini (Manchester United) is shown the red card for fighting. Attempt blocked. Michael Dawson (Hull City) right footed shot from outside the box is blocked. Assisted by Paul McShane. Corner, Hull City. Conceded by Chris Smalling. Corner, Hull City. Conceded by Víctor Valdés. Attempt saved. Nikica Jelavic (Hull City) right footed shot from the centre of the box is saved in the bottom right corner. Assisted by Sone Aluko with a cross. Substitution, Manchester United. James Wilson replaces Juan Mata.